(30" x 30"), c. 1980. Note: Artworks from this collection generally must be shipped from the collection rather than directly from our gallery. Please allow a few more days for shipment to your location. Silva Joseph, 1995 (Photograph © Anthony Hart Fisher 1995). Silva Joseph was born in Leogane, Haiti in 1930. 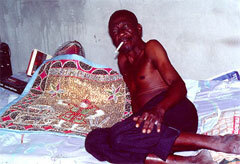 He was initiated into vodou in 1955, and became a houngan in 1970. 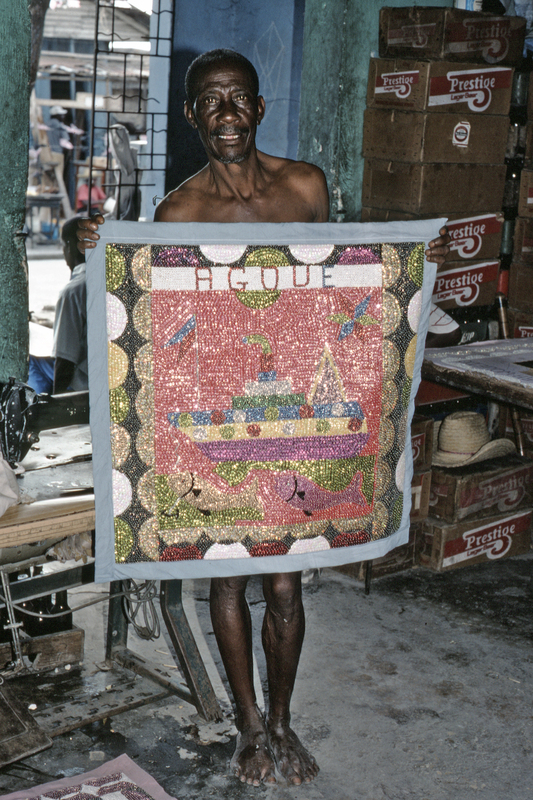 He created his first vodou flag in 1972. 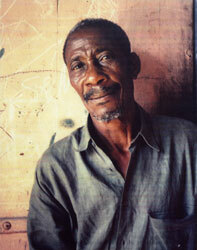 He operates a peristil or temple and studio in the BelAir neighborhood of Port-au-Prince. He works in the tradition of BelAir's famous flag artists, such as Tibout, Joseph Fortine and Luc Daniel Cedor. Silva Joseph's work is published in Sequin Artists of Haiti (Girouard, 1994) and Sacred Arts of Haitian Vodou (Cosentino, 1995). (biographical info taken in part from Tina Girouard's Sequin Artists of Haiti).